Do audiophile 'tweaks' really work and if so, at what price? John R. Potis discovered that to his surprise, a handful of budget-priced Vibrapod™ vinyl isolation 'pods' could elevate even his system to a new level of performance. Many thanks go to Mr. Sam Kennard for his help and for providing the review sample. 50°F To 100°F temperature range Available June 15, 1998. 10% of all sales is donated to outreach organisations. Attack of the Pods from Planet Kennard! Call me anything including late for dinner, but don’t call me a tweak. I’m no tweak. For the most part, I don’t even want to hear about your favorite tweak! And I sure don’t want a steady diet of reading about them in my favorite magazines! Oh, how some can go on and on about contact cleaners is just beyond me. How anybody can go on for pages and pages about the sound of a piece of wire astounds me! I don’t know whether to send them a congratulatory letter on their hearing acuity or just suggest that they take their medicine! Oh, I’ve tried a few, I’ve done the "cones" thing, I’ve tried the contact cleaner thing, I’ve done the sorbothane pucks thing and I’ve tried the cable thing, all largely to no avail. Don’t misunderstand, I’m not saying that none of these have an effect (though most don’t), I’m saying that pouring money into them returns you little bang for the buck and even when something does effect a change, who is to say whether it’s a good one or a bad one? All one really knows is that it’s "different". So when Sam Kennard of "The Vibrapod Company" E-mailed me that he wanted me to try something, I politely agreed. Why be rude! I’ll give what ever he is talking about a try and politely apologize for not hearing any difference in my system ("I guess my system is just immune to your tweek. Sorry!"). Promptly, I received a package of what Mr. Kennard calls "Vibrapod™ Isolation Pods". Oh, goody. Vibrapods are a new isolation device designed to isolate components from mechanical vibrations transmitted through equipment via the shelf/stand it rests upon. Now, I’ll be very open and up front about the fact that Sam Kennard is a friend of mine. But I swear to you that this has absolutely no bearing on what you are about to read. If a friend of mine thinks he’s on to something, and I think he’s nuts or is about to make a fool of himself, I think it would be my duty, as a friend, to tell him so. I would rather be a friend than a facilitator. Although I have been sent "tweeky" things in the past, I’ve never heard the claimed benefits and I’ve been up front and told the sender as much. In the back of my mind also is the possibility that these people know exactly what it is they are sending me and if I pretend to hear it, just to appease them, then I’ll just be squandering what ever respect or credibility I have. No way José. So, several days went by and I got a couple E-mails from Sam asking had I tried them yet! He really wanted my opinion! As convincingly as I could, I explained to Sam that I was indeed going to, but had not yet had the opportunity. Truth is, I guess, I could have, had I really been interested. But I gave him a promise that by next Tuesday, I would indeed give them a shot. So, on Tuesday morning, I grudgingly and half heatedly set off to fulfill my obligation to my friend. I went to my upstairs listening room, armed with 24 of these black vinyl donut looking "thingies" and I looked at my system. Of all the components, under which would I try these "Vibrapods" on first? Which of them would most benefit? I settled on my Conrad Johnson PV12a pre-amp. As a tube pre-amp, I figured that it could do with some additional immunity to vibration. So, I removed the preamp from its shelf, I placed 4 rows of 3 each of these pods on the shelf, placed a glass shelf on top of the pods and placed the CJ on the glass shelf. 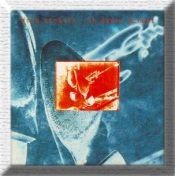 I then hit the ‘play’ button and began playing a CD that is a favorite of mine, Dire Straits’ "One Every Street". Track #6, "You and Your Friend" in particular. Its opening sequence of steel guitar and cymbals is an excellent test of sound stage width. I had been listening to this track because as I had just installed a new speaker pair into my system, I used this track to judge that the speakers were too close together because I was not getting the sound stage width I was used to. With preceding pairs of speakers, the width of the sound stage had been much wider. But as my mission on this day was not to fiddle with speaker placement, I didn’t bother moving anything. I hit the play and #6 buttons on the remote and settled down for a little listening. NO WAY!! I must be hearing things!! The Sound stage was now as wide as I have ever heard it! And, where did all that bass come from?? The bass had become positively visceral! In total disbelief, I jumped up, picked up the preamp, swept off the pods and replaced the preamp to where it had started its day. Play... #6,…collapsed sound stage again. Bass?? Not bad, but not like it was. So up again I jumped, replaced the Vibrapods, the glass shelf, the PV12a, play...#6....ahhhhhhh. There it was again. Soundstage was wide, deep and precise in its placement of instruments. Bass was clean and more articulate than before. It was obvious that this was not going to be another wild tweak chase! So.... What next to isolate? How ‘bout...my CD changer?? I use a Yamaha CD changer as a transport (I told you I’m no tweak!) 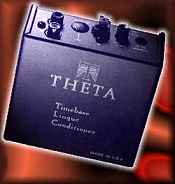 and run it into a Theta TLC and then into a Meridian 563 DAC. This, I thought, would be a tough test. I mean, isolating tubes, I can kinda see, but isolating the CD changer? Yeah, right! So, I followed the same procedure as above. Placed 3 rows of 4 pods, placed another shelf on the pods, and placed the Yamaha on top of that. Put back on the same song. Unbelievable. Im serious! I couldn’t believe it! The sound stage was wider still! The opening guitar riff was coming out of the CD player that is to the left of the speaker! Bass, again, was even more visceral! It was downright physical! But there was something else too! (Is anybody else hearing the ‘Twilight Zone’ theme music???) The "canvas" upon which the system was painting the image was actually "blacker" than it was before. Out of this new black abyss the instrumental outlines were sharper and more vivid than what I had been hearing. Sam later told me that some report a drastic cleansing of the treble too, sometimes to the point of cleaning up and reducing sibilants, but I didn’t experience that as far as I could tell. But after what I did experience, I wouldn’t doubt it. Mind control drugs! That must be what is at work here! The Vibrapod Company has found a way to polymerize some kind of mind control drug, infuse it into the vinyl pods in a way that will allow it to slowly evaporate into the air in a time release fashion thereby introducing said drug into the listener as he breathes! Naaaa... as I said, Sam is a friend of mine, and while he’s a nice guy, he’s not that smart! Instead what Sam has come up with is a vinyl ring that when placed in numbers (numbers required vary according to weight of the component) under your rig, will do an outstanding job of isolating it from the vibration transmitted from your speakers, through the floor, into the rack and, finally, into the components. This Vibrapod is a black vinyl ring with a second concentric ring within it, looking very much like the suspension for a dynamic speaker driver. The "ring" sits on the shelf and this inner ring, which is raised in level compared to the outer one, is what supports the component and it really does so in the exact same way the speaker suspension supports the woofer, it’s there that you get the suspension compliance. Unfortunately, I was now out of Vibrapods. At this point, I’ll just have to wait until Sam sets up his distribution system, which will be in place on June 15, 1998. Sam is selling them factory direct for the extremely reasonable price of $6 each delivered in the Continental US. Each Vibrapod can support between 2½ and 4 pounds, 2 5/8 pounds being ideal. The average CD player will require 6 Vibrapods and cost you $36. Given the prices of numerous snake oil remedies readily available, which accomplish nothing, more than a drain on your bank account, $6 each is a real steal. Oh, wanna know the best part? The Vibrapod Company is going to donate 10% of sales (that's sales, not profit!) to Outreach Organizations. So, do something for your system as well as for charity and give Sam a call. You won’t regret it. This doesn’t make me a tweak, ... does it?? © John R. Potis Jr. 1998. In the weeks since I wrote the preceding review, I’ve had the opportunity to receive more "Vibrapods" and have had the opportunity to experiment with placements. The improvement was so real and so positive that I went out and purchased several sheets of ¼ inch glass with which to better implement the pods. I had them cut to 13 inches by 16 inches, which guaranteed that each would fit under the feet of any component in the house. I now placed the pods on the shelves, placed the glass sheets upon the pods and then set the component on the glass sheet. It works wonderfully and actually looks nice too! I’ve also been playing around with the configuration of the Vibrapods under that glass. Sam Kennard tells me that he has experienced better success with the Pods placed around the outside edges of the component. To be honest, I’ve been shuffling components and speakers from room to room and have temporarily lost my "reference point". 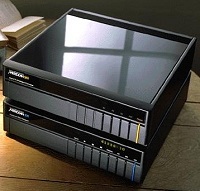 I can tell you that in what ever configuration I use, the difference is large and definite and always for the better. I’ve also been loaning these things to friends. With no prompting from me, they always come back ecstatic about what they find. People with distinctly "mid-fi" systems are every bit as likely to benefit from the Vibrapods as people with much more expensive components. It makes sense when you think about it, more budget priced components would likely have had less vibration isolation consideration during the design stage. Owners of budget gear should, in my opinion, consider them as a "no-brainer" treatment that can be utilized as components are upgraded. As I sit here typing, I’m spinning vinyl. My "B-team" turntable is a Technics SL1500 MKII with a Sumiko Blue Point installed. Of course, it has Vibrapods installed underneath. Well, I just noticed that I can really crank the music with no feedback, something I couldn’t do in this smallish room before. Call me stupid, but in this, the age of CD, I hadn’t, until now, even considered what using it under a turntable can do. You vinyl spinners out there should take special note. You won’t believe what this inexpensive tweek can do for your records! Forget about the ridiculously expensive air isolation devices until you give these a shot. For increased dynamics, better soundstage focus, depth and width, more physical and articulate bass, and maybe even a smoother treble, these Vibrapod Isolation Pods are enthusiastically, nay, emphatically recommended! More information about Vibrapods can be found at the Official Vibrapod Company Web Site. Text © John R. Potis Jr.; HTML © SMR Home Theatre and Images © SMR Home Theatre cannot be reproduced without permission. 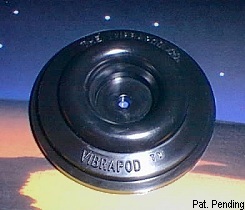 "Vibrapod" is a trademark of the Vibrapod Company.